Ash has worked in animal shelter medicine for nearly a decade, and has helped identify some of the most obscure mixed-breed dogs. Congratulations. You're the lucky caretaker of a beautiful canine companion—man and woman's best friend. Despite all this hype about designer dogs, the days of referring to mixed-breed dogs as mutts are over, and now we enjoy the pleasure of glorifying their uniqueness with complimentary terms like "blend" (because they deserve it). Let's be honest. 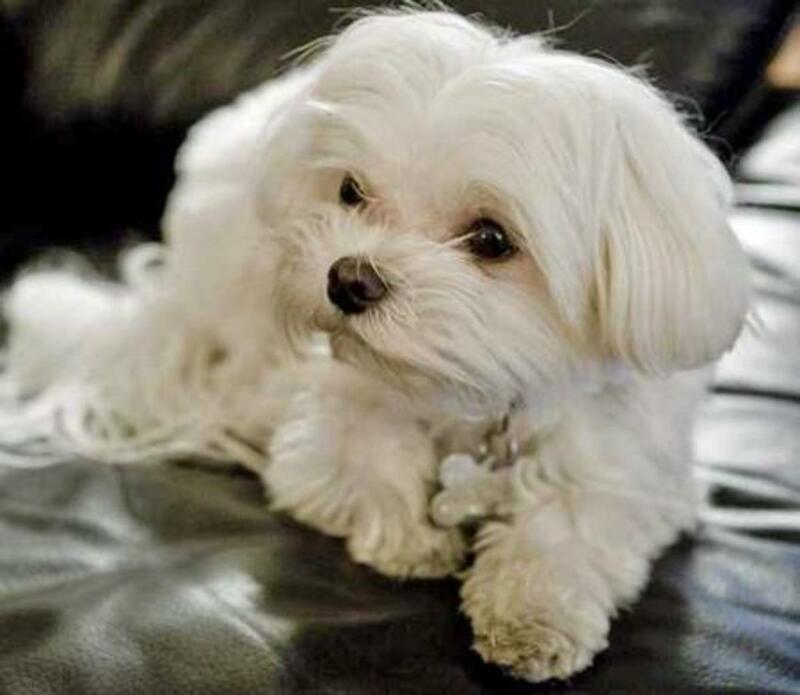 You are dying to know the ancestry of your dog and his/her genetic makeup. 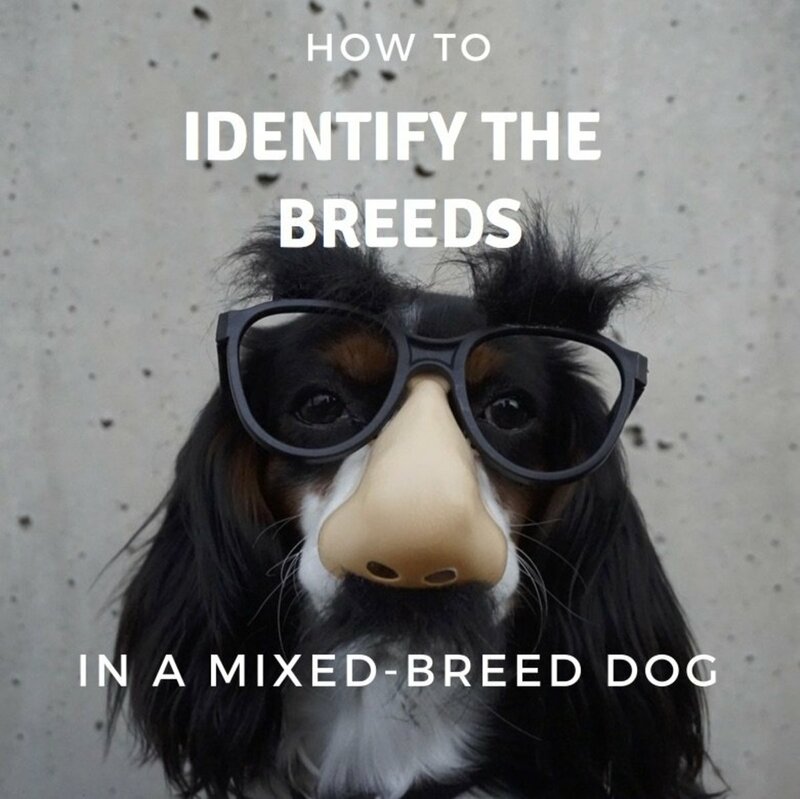 Now, before you rush ahead and blow big bucks on a canine DNA test, let's go over some key canine traits that are also identifiable in mixed-breed dogs. We'll be taking a look at muzzle shape, tail style, ear type, coat type (color and pattern), body type, and behavior. We will also discuss what classifies a purebred or a crossbred dog, such as the ever-so-popular Goldendoodle. Let's get started, so we can finally answer that burning question: "How do I know what breed my dog is?" Is your dog an Aussiepoo? A Whoodle? A Golden Dox? A Corgle? Or a Chug? Are Mixed-Breed Dogs Healthier Than Purebreds? Grab a pen and a piece of paper, and note down these key characteristics as you go. There are three types of canine head shapes, starting from shortest to longest muzzle: brachycephalics, mesocephalics, and dolichocephalics. Brachycephalics have notoriously short muzzles (think Pug); mesocephalics have your standard Labrador Retriever-shaped skull, and dolichocephalics have narrow eyes and elongated muzzles (Collies). The shape, length, and thickness of a dog's tail offers quite a bit of information about its lineage. It is important to distinguish between a naturally bobbed tail and a docked tail. 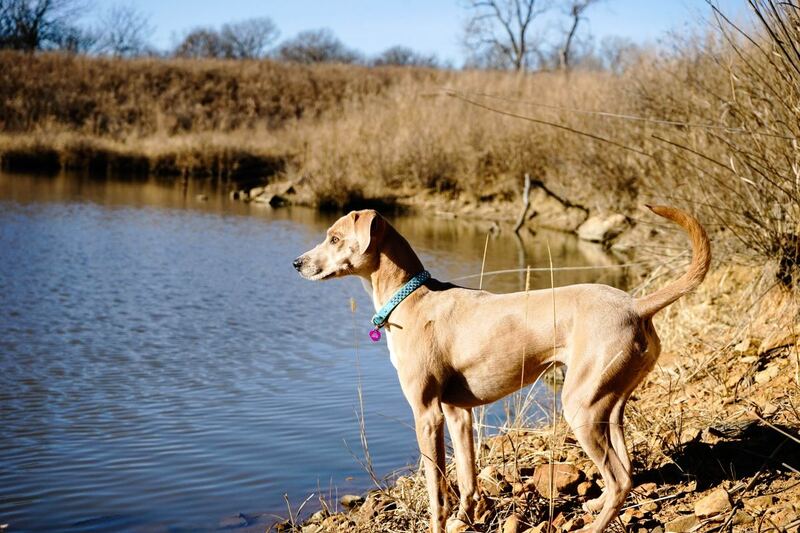 Some dogs such as Dobermans, Boxers, and English Pointers have their tails docked at an early age. It may be surprising to see one of these breeds without a docked tail, but progressive veterinary care is moving in that direction (especially for non-working dogs). 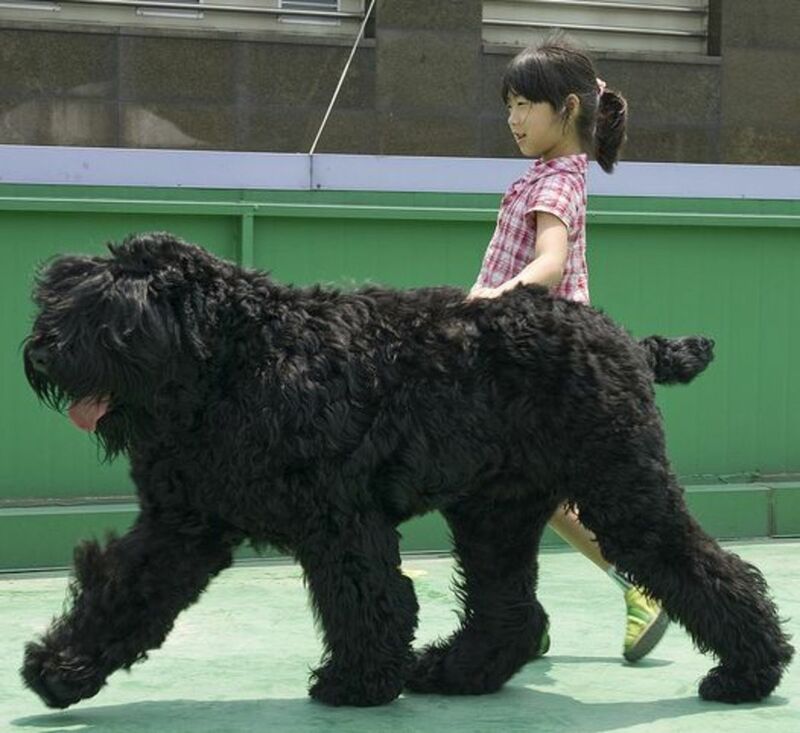 Several dozen dog breeds have a bobtail genetic mutation. 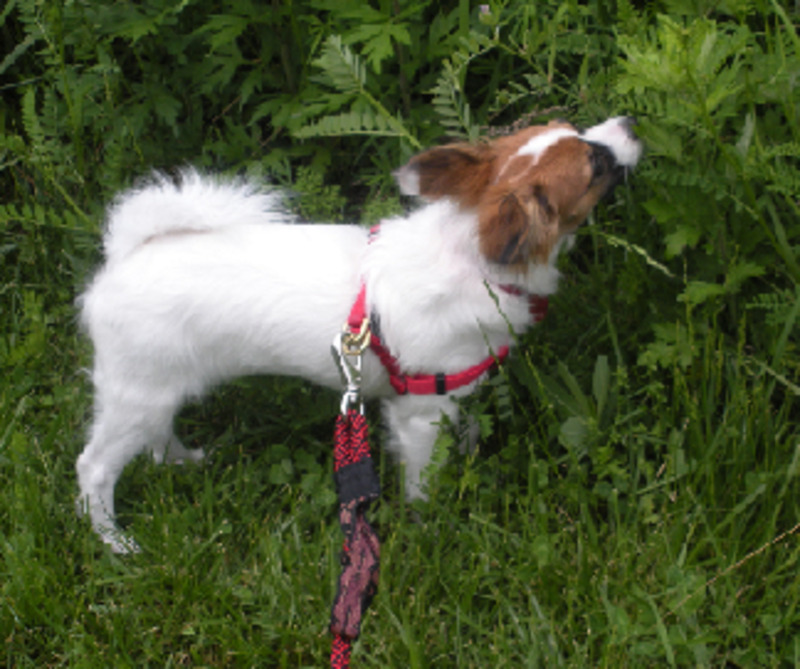 These breeds include the Australian Shepherd, Brittany Spaniel, and the Jack Russell Terrier. Dog breeds that do not possess the mutation, but naturally have bobtails include: Boston Terriers, English Bulldogs, King Charles Spaniels, Minature Schnauzers, and Rottweilers. A ringtail is full, and arches over the back of the dog. A sickle tail, too, arches over the dog's back but points towards the head. A screw tail resembles a corkscrew (characteristic of Pugs), and an otter tail resembles exactly that—an otter tail. The otter tail is thick and full and works like a rudder in the water. These tails are characteristic of your water-loving dogs, the Labrador Retriever. A whip tail is long, thin, and straight. Is your dog's muzzle short, average, or long? Brachycephalics (short), mesocephalics (medium), dolichocephalic (narrow eyes, long). Is your dog's tail docked or naturally bobbed, a ring, a sickle, a screw, an otter, or a whip tail? A bobtail is close to the body and short, a ring tail curves around the back, a sickle tail points towards the head, a screw tail represents a corkscrew, an otter tail resembles a thick rudder, a whip tail is thin and long. Are your dog's ears erect or droopy, short or long? Ear types: prick ears, cropped, blunt or round, bat-eared, hooded, candle flame, drop or pendant, folded, v-shaped, filbert-shaped, cocked or semi-pricked, button-eared, or rose-eared. Smooth and short-coated, medium-coated, wire-coated, curly-coated, hairless. What is the dominant color and patterning of your dog's coat? White, cream, gold, red, brown, blue, gray, black. Patterns: bicolor, tricolor, merle, harlequin, brindle, saddle, sable. What is your dog's height and bone structure? Thick and boxy or slender and long, tall and long-legged or short and short-legged, slender and deep-chested or muscular and athletic? What unique traits are particular to your dog? Ridgeback, webbed paws, spotted tongue, heterochromia, double dew claws, chondrodysplasia? Identifying your dog's coat type is fairly simple. Smooth or short-haired dogs have fur that is close to the body. Medium coats are often an inch long and require moderate grooming to prevent tangles and matting (Golden Retriever). Long-coated dogs often have hair or fur that hangs to the floor and require heavy grooming as part of their routine maintenance and care. Wire-coated dogs are bristly to the touch, and curly coated dogs have soft ringlets or waves much like human hair. Hairless dogs are hairless. Color: The most common dog coat is solid. A brown dog can be classified as liver or chocolate brown, and dogs with red coats can be classified as orange, rust, cinnamon, and ruby (think Irish Setter). 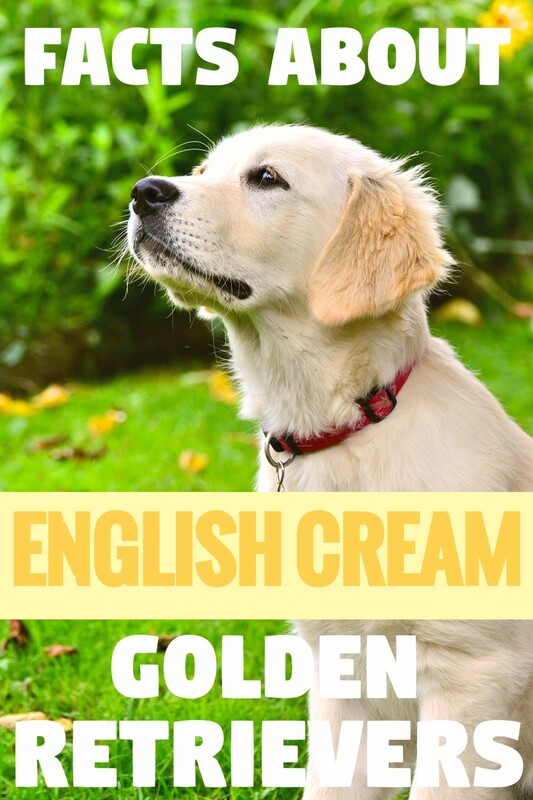 Gold colorations include pale yellow, blonde, honey, and apricot, and cream coats are nearly white. Black and white coats are self-explanatory, although each can have underlying tones. Blue dog coats appear as an off-gray when compared to standard gray. Bicolor coats contain two colors and are otherwise known as patched or tuxedo. Common color combinations include black and tan or white and black (German Shepherds, Rottweilers, Border Collies). Tricolor coats include three colors. Tricolor coats are often contrasted with a standard white chest and underbelly, and surrounding coloration around the dog's dorsum, face, and down the limbs and tail. Merle coats include patches or marbling of color primarly around all parts of the dog but the stomach. Harlequin coats have uneven spotting across the body and are typically black and white (Great Danes) as opposed to standard spotting as seen on the Dalmatian. Brindle is your typical tiger stripe (black, brown, and gold). 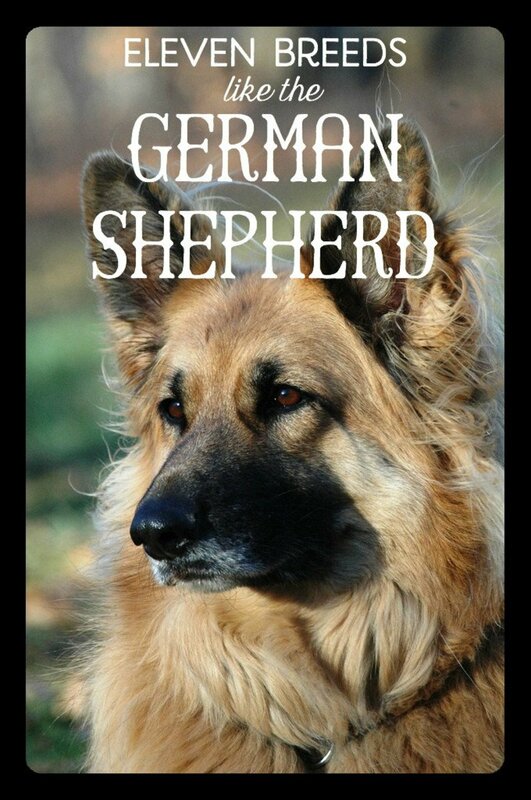 Saddle patterns are what you frequently see on German Shepherds, with black coloring on the back and a gradual fade. Sable is characterized by black-tipped hairs which standout against other lighter coloration. Average weight of your dog after one year of age? Thick and boxy or slender and long? Slender and deep-chested or muscular and athletic? Ridgeback: One of the most telling traits of the Rhodesian Ridgeback is . . . the ridgeback, a ridge of hair along a dog's back running in the opposite direction of the coat. Mixed-breed dogs can possess this trait. Webbed Paws and Dewclaws: Inspect your dog's paws. Are the feet webbed? Does your dog have dewclaws, otherwise known as vestigial digits between the inner wrist and elbow or inner ankle and knee (human anatomy terms, if you will). Perhaps your dog even has double dewclaws (generally characteristic of prominent large breeds). 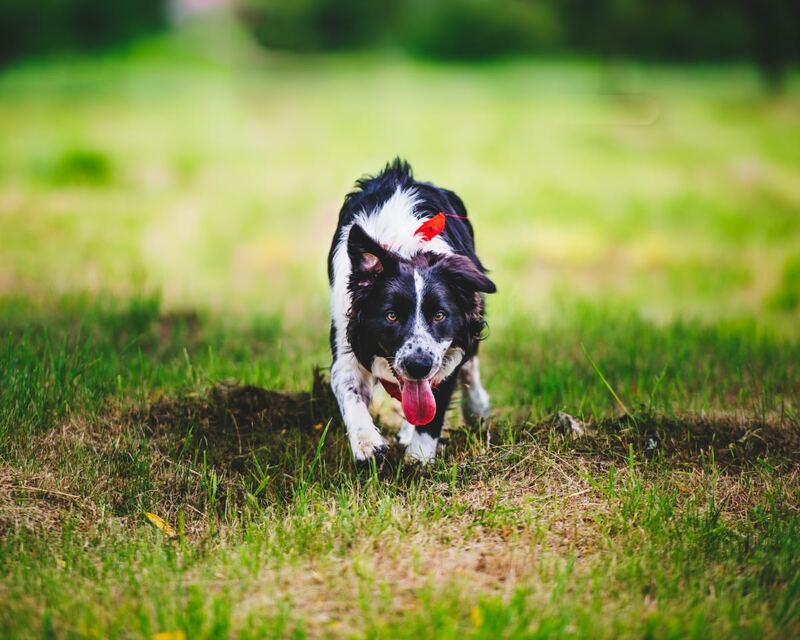 Spotted Tongue: Look at your dog's tongue, is bubblegum pink or spotted? There is the common misconception that the Chow Chow is the only breed that possesses a spotted tongue, but nearly three dozen breeds display this trait. 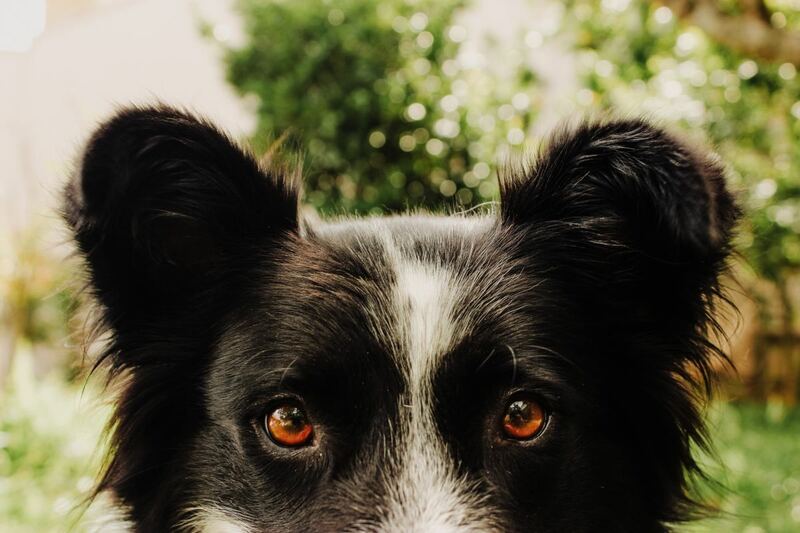 Heterochromia: How about your dog's eyes—is one blue and one brown? This condition, while rare, may be linked to Huskies, Australian Shepherds, and Louisiana Catahoula Leopard Dogs. Chondrodysplasia: An intentionally bred trait of Bassett Hounds, Dachshunds, and Corgis. These breeds are often affectionately termed "low-riders" in veterinary medicine. Short legs, long bodies, and sometimes bowed legs, their body types give them an advantage in the field. This opens the floor to the big debate surrounding nature versus nurture, but in many circumstances, canines will act out on their natural instincts. Perhaps the two most classic dog behaviors involve herding breeds and pointers. These canines exhibit behaviors that are hard to miss. Herding breeds tend to herd, as you could've guessed, and can often be seen stalking moving objects (people, small animals, or moving objects such as skateboards, bikes, etc.). All too often, they may nip at the rear of crawling babies, running children, and household critters. Sometimes, in addition to herding instincts, these breeds may possess a high prey drive and can go after small animals. 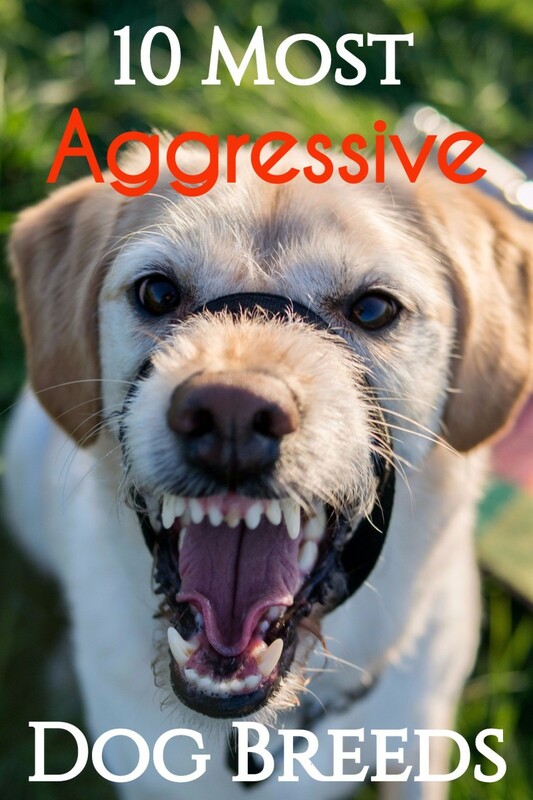 Whether or not this high prey drive reveals what your dog is mixed with, it is wise to be aware of this tendency to keep everyone safe, including your dog. The classic pointing stance is also a dead giveaway of a dog that may originate from a hunting breed. A dog who points will sniff out birds, freeze, and then "point" towards the prey. Some of these breeds also have what's called a "soft mouth," which allows a dog to retrieve prey without mangling it as opposed to terriers and ratters who can roughly shake prey (rats) in their mouth and kill them instantaneously. It is usually apparent whether or not a dog loves water, or does well in water for that matter. Newfoundlands are known to adore water—you can't keep them away from it. There are some breeds (sometimes the boxier, bulkier, muscular types) that despite their best efforts, just can't compete with the naturals. Their strengths lie elsewhere. Let this be a clue. One of the results in Google images reveals an English Springer Spaniel. Although this is not identical to my mixed-breed dog, I can now research Spaniel breeds and further narrow down my search. My final results helped me to discover that my beautiful mixed-breed dog most closley resembles a Working Spaniel. Yes, the traits and personality match! You can cross-compare breed types on websites like the AKC's dog breed database. 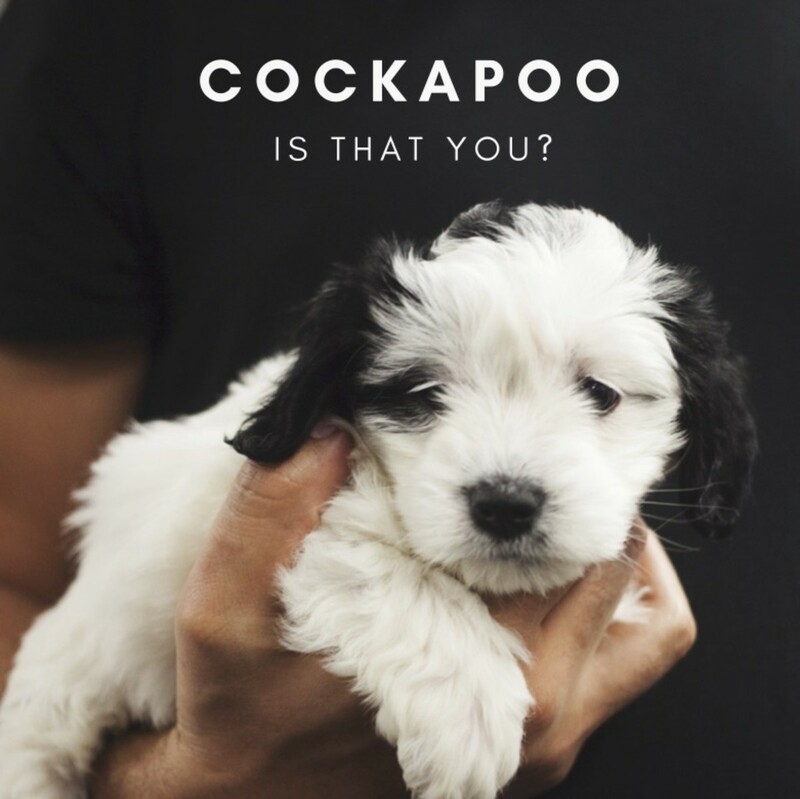 If all else fails, your veterinarian and veterinary team will have a good idea of what your dog is. 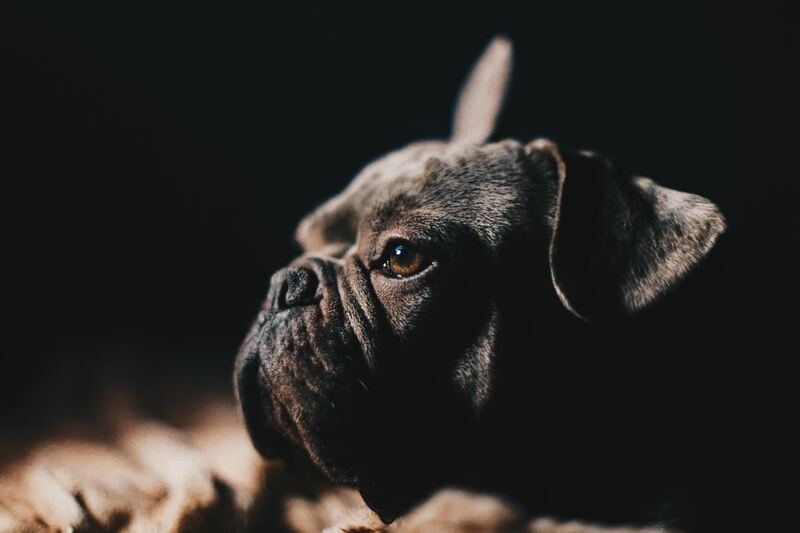 Many individuals in the veterinary community see hundreds of dogs weekly, and it is likely that they will be able to narrow down your dog's breeds. Still not satisfied? Opt for a dog DNA test. Embark DNA and Wisdom Panel are commonly recommended dog DNA test kits. They have been recommended to me by colleagues. As with all DNA tests, there is room for error and results aren't always conclusive. What's the Difference Between Purebred and Crossbred Dogs? This is an easy rule out. 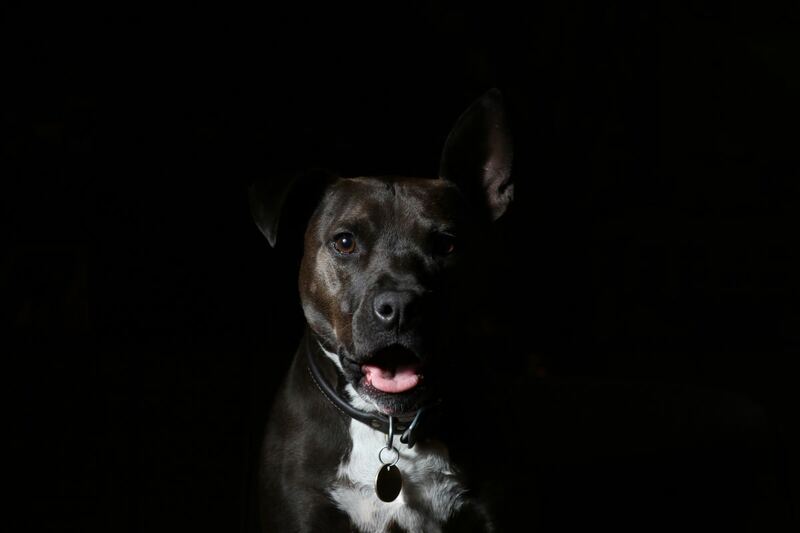 If you acquired your dog from a certified registry and source, such as an American Kennel Club breeder or a breed-specific rescue, you most likely have documentation of your dog's pedigree or a firm idea of what your dog is comprised of, and hooray, you scored 100%. Yes, your dog is a purebred. Your feathery Golden Retriever's parents are, you guessed it, Golden Retrievers. Portmanteau Naming: A linguistic blending or the combination of multiple words and their sounds to create a new word. You're probably familiar with one ever-so-popular designer dog or hybrid canine, the Goldendoodle. In case you missed it, "golden" + "(d)oodle" = Golden Retriever and Poodle (standard or miniature). Two standardized purebred parents were bred to produce a 50/50 blend. If the genetic lottery plays out correctly, your Goldendoodle will be blessedly affectionate, intelligent, and sociable, and will have inherited the best traits of both parents. Portmanteau naming at its finest. What Are the Best Crossbred Dogs? Do keep in mind, however, that not all purebreds or crossbreeds will exhibit the desired traits or temperament of their parents. 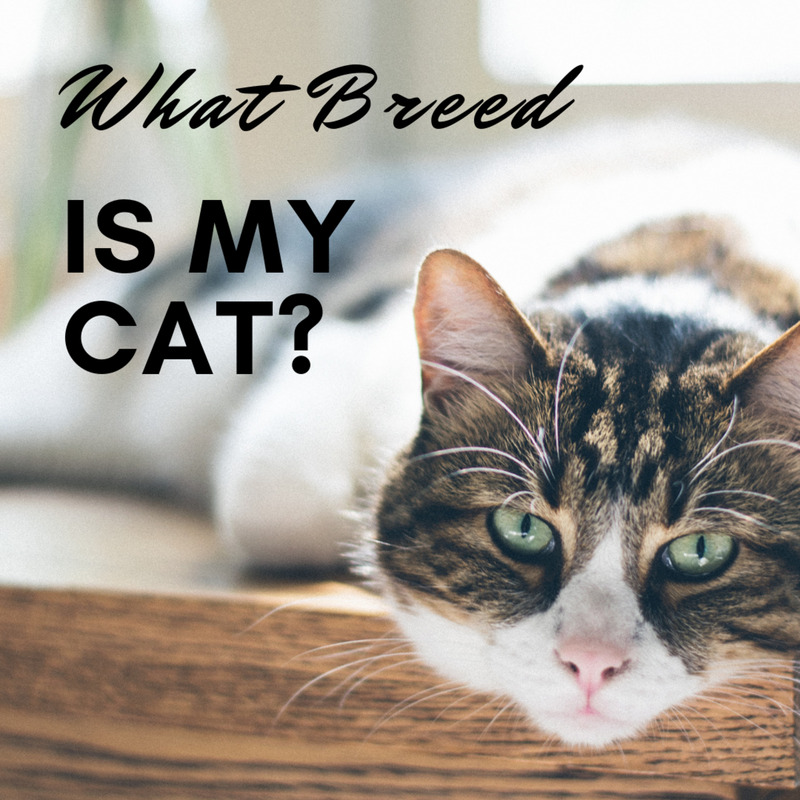 Breeding always incorporates the risk of inherited breed-specific health issues and similar negatives attached to concentrating a genetic pool. Traits like aggression and genetic malformations can be more common in intentionally bred dogs if not done responsibly. 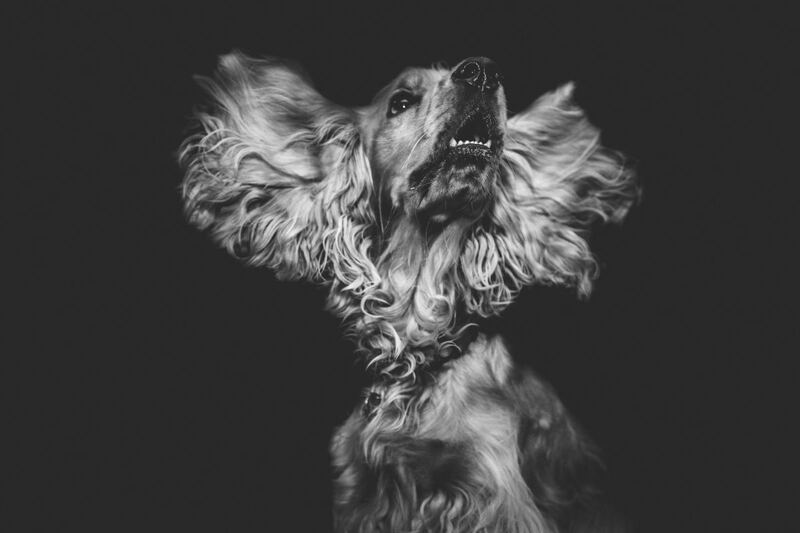 "The incidence of 10 genetic disorders (42%) was significantly greater in purebred dogs." "The incidence of 1 disorder (ruptured cranial cruciate ligament; 4%) was greater in mixed breed dogs." The good news? Your mixed-breed dog is less likely to develop dilated cardiomyopathy, elbow dysplasia, cataracts, and hypothyroidism. The bad news? Mixed-breed dogs are more likely to rupture a cranial cruciate ligament. All dogs deserve the best care possible. Let's get that straight. 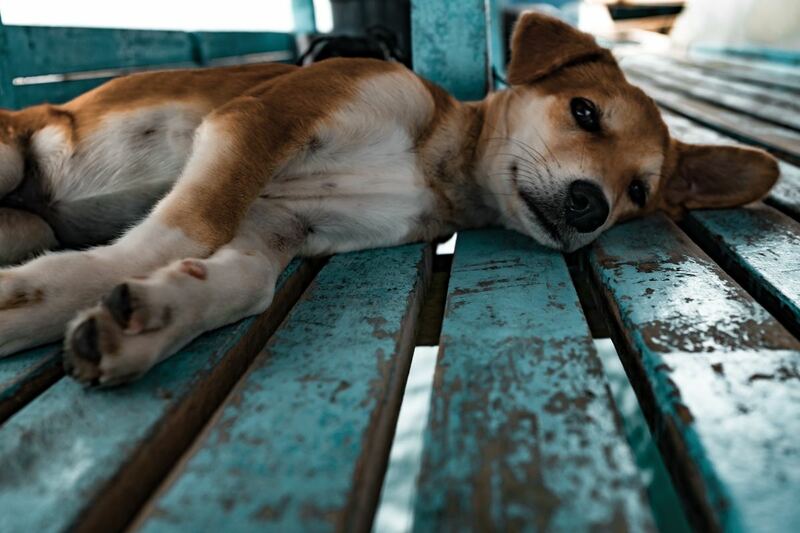 If you landed on this article, you love dogs! To ensure that your dog lives a happy, healthy life, always offer adequate exercise and proper nutrition. Keep your dog at a healthy weight, avoid synthetic foods, keep your dog current on vaccinations, and follow up with regular health checks. If you are considering finding a purebred or crossbreed, seek out responsible, licensed breeders, and always consider adopting from a purebred rescue. If you are simply seeking out a loving companion, visit your local shelters. I have come across so many fantastic mixed-breed dogs (my own included) in my many years of working in veterinary medicine. There is a shelter dog out there waiting for their forever home that is sure to melt your heart. What Breed(s) Is Your Best Friend? New data suggests that the behavioral tendencies of dogs can be predicted by their height, weight, and whether they have long or short skulls. A pictorial glossary of the various shapes of dog's ears and the labels that dog breeders use to describe them. I recently got a very underfed puppy, he’s y’all tho almost 2 1/2’ tall. He has long toes, big feet , lite Blu eyes, pink nose, floppy ears , white short hair, pink skin, few black spots, rectangle muzzle, from side view, long thin tail. MY DAUGHTER WAS GIFTED A PUPPY , IM NOT SURE WHAT BREED IT IS BUT I SUSPECT THAT ITS A MIX WITH A PITT BULL, COULD SOMEONE HELP ME IDENTIFY MY PUP? I’m not sure about one dog it’s a dog that has a red bow on its head and is brown white and black please help me figure this out pleaaasse! not sure what my dog is. He looks like some terrier breed mix. He has pricked ears, medium coated and somewhat curly, pointy muzzle, red brown and black coat and a long thin tail. Im not sure if mine dog is vizsla or not.the only distinct on him is his ear is erected or pointed ear.usually viszla has v shape ear droppong down.please help. Does she have blue eyes and a black spot on her left one by any chance? I adopted a dog who is about 14 months old which was run over a couple of months ago. I am still not sure what breed she is but here are some observations : narrow eyes and elongated muzzle + short sword tail + button ears + smooth, medium-coat + dark, brindle pattern + approximately 12 pounds + a little slender and long + long legged + deep chested + dew-clawed + bubblegum pink tongue + has heterochromia. Please answer this, I will really appreciate it. We have littermates 4 months old. We were told they were a Lab/Shepard mix. The male is long, lanky, and tall, huge feet. He is a cream white color with kind of course and wiry with elongated head and muzzle and he has curly eyelashes with a wiry beard and whiskers. He is kind of serious natured like he is thinking all the time but eager to please. Who could have been in the woodpile? I adopted a 15 month old dog. Here are her particulars. I heard she was one combination, but think she's another. What are your thoughts? Short muzzle+V ears+bobbed tail+smooth coat(solid black with white spot on chest)+webbed feet and dew claws+loves water but not sure can swim because+muscular and boxy and slightly Chondrodysplasia-ish+weighs 20 lbs and isn't expected to get over 25 lbs. I already know what her mix is I just want to know what you'd guess. My dog has a medium muzzle+ drooped ears + thin medium sized tail + medium hair length smooth coat + black coat with white and black patches on the extremities of the leg + hates water +too friendly + sometimes the tail curls up and sometimes it will be straight. Please tell my dog's breed. S—Please share your knowledge of Vizslas. Perhaps it's the wired-haired? Looks like the standard gained AKC recognition in the US in 1960s. Will update the content to reflect this when I get a chance. Feel free to share your knowledge as well! Mutt quinlan—15 weeks, they still do so much changing! Many dog blends are often grouped into the "lab" category as well. It's hard to say. I think coat pattern and color gives a lot away as well as ear shape. Rishi—I think of Coonhound, Beauceron, Rottweiler blends with (black and tan and short coat). Joy Mehan—Cleo sounds unique indeed. Might have some type of shepherd (not necessary Australian). I just had to say that Vizslas aren't a mixed breed. That was just bothering me since Vizslas have a very interesting and long history. Everytime I think I have my new dog figured out, she morphs. Particularly her color. She was fawn and white with a black mask when we got her; now she has sabling on the sides of her face, ears, and forelegs PLUS she's going all liver-colored on her belly around the white freckled patches. I think she's about 30% Italian Sportscar, she's so fast (we're thinking about changing her name to Dammit, because that's what we holler when she gets out). Must be part Greyhound or Whippet. Her head, though, says...hound? Retriever? Vshaped ears, blunt muzzle, soft mouth...tendency to eat shoes. She's also got a lot of Schmoozhound in her, which is why we can find her when she runs off--she stops to visit everyone she meets. My main concern is knowing how much to feed her. My other dog (Maggie), who must be part Corgi (size, herding behavior, cylindrical body) gets short rations to prevent her becoming roly-poly, but Cleo is all muscle (including between her ears!) and I want to be sure she gets enough to eat; maybe then I can get a new pair of sandals without her having them for a light snack. The freckles and intelligence reminds me of an Australian cattle dog. Sometimes Beagles or Cocker Spaniels (blonde) have those spots as well. Size and temperament may say a lot as well . . .
My dog is blonde, freckles, wavy coarse hair curly tail, flat ears. She is only about 18 weeks old. Very smart. A cuddling chi-poo—so adorable! Thanks for sharing with us about your beloved companion. I have a chi-poo....and the very best thing that has happened to me in the last 25 years of my life, she is devoted to me aND snuggles when I need it! She truly is my very best friend! Have you looked up Brussels Griffon or Griffon Bruxellois? Take a look! I have no idea what kind of dog I have, he is small, built between a weeny dog & Chihuahua but he walks with a stocky stance, almost bow legged, has large pointed straight ears, medium length hair, is a reddish brown color, tail that curls curls into a straight up into a “u” shape but his main characteristics is he has a little beard ! Lol! Please help, thanks so much! Congrats on your puppy! She sounds perceptive. With her luck, I wonder if she can pick some winning numbers. Thanks for your friendly comments and for sharing. I had to wake up my mixed breed puppy to tell her that she won the lottery. I wonder if that angry look she gave me can tell me anything about her breed? Nah, probably not. She went right back to sleep before I finished reading. Great article. I look forward to reading more of your work.